In the two previous posts, note the orange-colored handles on the Nicholson, Corradi, and Iwasaki tools. These are labeled “Disston” but, as far as I can tell, are no longer manufactured. I last bought some at least several years ago, I’ve forgotten from where, and have about eight in use and a few spares. Disston called them “Stronghold” handles as seen in this ad from 1930. They came in five sizes, from #1, the smallest, through #4, and the long, thin #0 for use with taper files for saw sharpening. The #3 is good for a 10″ rasp or file. There are three relief slits at the front of the handle which is surrounded by a steel spring ferrule. 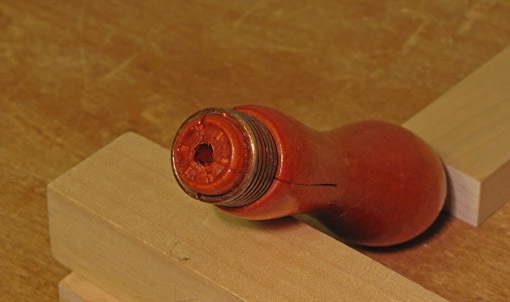 This construction grips the tang of the rasp well, prevents extension of the built-in slits, and makes the handle reusable because there is some flexibility to the bore. Best of all, these handles feel just right in my hand. 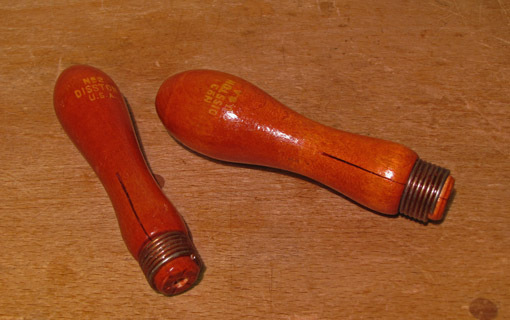 I wonder if one of the hand tool manufacturers such as Lie-Nielsen or Lee Valley would be interested in making these handles if patent issues could be cleared. By the way, I do not have the Disston handles on my Auriou rasps only because I am unable to remove the less comfortable original handles despite lots of pounding. Rasps are used more effectively if one adopts the attitude that this truly is a tool to be used with sensitivity. The rear hand (on the handle) supplies power and direction while the forward hand aids control with a light hold. Push to cut, disengage with a slight lift, retract, and repeat. The rasp is angled to the direction of push (remember the teeth are in diagonal rows), but avoid a pronounced sideways motion which will make the teeth slice into the wood across their width, causing the tool to grab and create deep scratches in the wood. Adjust your push and pressure to the grade of the selected rasp which is based on the stage of the shaping process. Flip freely from the flat side of the rasp to the convex side depending on the contour of the work. As you get closer to finishing, lighten your touch. Use the weight and stiffness of the tool to sense lump and bump irregularities as you fair the curves of the wood. As with all woodworking, good adjustable lighting helps a lot. 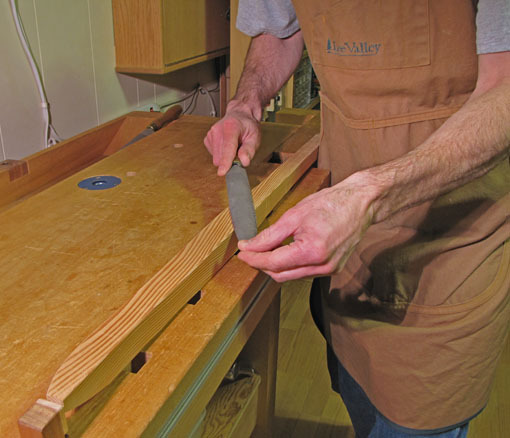 For purchasing 10″ half-round rasps for fine furniture making, the subject of these posts, here are some suggestions. You can try out tools prior to making your choices at shows, some stores, Lie-Nielsen Hand Tool Events, woodworking schools, or your friends’ shops. Lie-Neilsen sells similar handles unpainted but with the wound wire reinforcement in three sizes, very cheaply. Pick them up when I call in; not sure if they mail them. I tried one of those handles (from a different source) and I’m not a fan. The ferrule comes up too high and there’s no “waist’ to the handle shape so it does not sit in my hand well. Also, the bore does not seem to have the same flexibility of the Disston. All three articles were very helpful, thank you. I have the Shinto (love it) and was thinking about the Auriou rasps. Based on what you have said, I think I’ll get a couple. Thanks again. You’re welcome. Thanks for reading. I don’t think you’ll go wrong with the Aurious.